While you may think physical gold is the go-to gold investment, we believe gold mining companies are the best way to play the price rally for big profits. You see, the price of gold is already up 9.5% in 2017. On Dec. 30, 2016, an ounce of gold sold for $1,151.70. Right now, the metal trades at $1,261.50. And Money Morning Resource Specialist Peter Krauth thinks it will add another 11% to trade at $1,400 by the end of the year. Gold mining companies are poised to make the most money from that 11% rise. After all, miners make a larger profit on every ounce sold when prices are climbing. That's why we're recommending two gold mining stocks today, which are set to rally 88.9% and 49.4% by April 2018. The first catalyst behind the gold rally will be increased volatility in the stock market. Gold is considered a safe-haven investment. These "safe havens" are long-term assets investors keep in their portfolio to hedge against any downturn in the market. That's because the value of safe havens either increases or stays the same when stocks become volatile. While no one can precisely time a downturn, the United States has been in an eight-year-long bull market since the Dow Jones bottomed from the financial crisis on March 6, 2009. The index has broken records this year as it soared above 20,000 and 21,000 for the first time ever. It's prudent to think a stock market correction is on the horizon. Ongoing political uncertainty could also send the market into a volatile frenzy. Brexit negotiations between the United Kingdom and European Union are already underway. On March 29, UK Prime Minister Theresa May triggered Article 50 – an EU clause outlining the necessary steps for a country to voluntarily leave the bloc – to begin the two-year exit process. Markets could also negatively react to interest rate policy. After raising rates last month, the Federal Reserve stated it plans to raise rates as many as three more times in 2017. That can cause markets to pull back, as it did in the aftermath of the March 15 rate hike. Since then, the S&P 500 is down 1.1%. On the other hand, the price of gold has gained 5.1% to $1,261.50 over the same period. It's clear that investors are buying up gold just in case something dramatic happens in the stock market. This growing interest in gold's safe-haven qualities will continue in 2017. The second factor that will push the gold price higher is inflation, which is currently at a five-year high of 2.7%. Inflation can hurt the economy because it means consumer prices are rising. When goods and services become more expensive, consumers are less incentivized to spend. That reduced spending fundamentally hurts economic growth. Slowing economic growth can spook investors into selling their stocks. And as we discussed, gold demand increases during a stock market sell-off. These two factors – market volatility and a rising inflation rate – will boost gold prices in 2017. 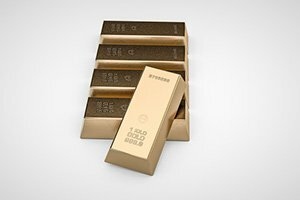 And while you could buy physical gold to play the price rally, storing and maintaining the quality of gold bullion can be a difficult long-term process. That's why we highly recommend investing in gold mining companies in 2017. Their profit margins are poised to increase significantly as the price of gold gains 11% to $1,400 by the end of 2017.